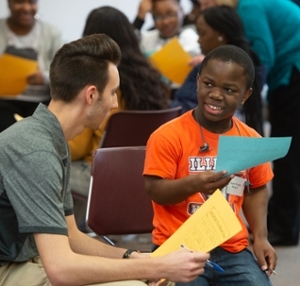 “Later, the students took a campus tour and experienced the SIUE Student Government’s Tunnel of Oppression,” she continued. “The significance of the Tunnel of Oppression and the other identity awareness exercises was to raise consciousness about oppression, and for the students to have a chance to walk in someone else’s shoes and be able to see the value in differences.” Approximately 30 CHS students enjoyed the day of activities, information and connections. 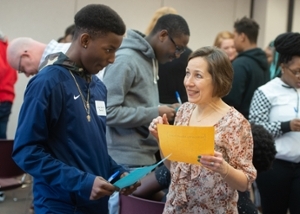 The “take-away” for the day, according to Harris Lee, was for CHS students to be able to identify at least one current SIUE student or employee who will help them stay connected to the University. SIUE alumna Kelley Brooks, assistant director in the Office of Admissions, fielded several questions from CHS students as a panelist. Taylor Robinson, Student Opportunities for Academic Results (SOAR) teaching assistant and National Guard member, encouraged students to find their place in college. Robinson received a bachelor’s in criminal justice studies in 2018 from SIUE. Joe Simpson, a junior in the College of Arts and Sciences, told the students about the value in joining organizations and clubs that will support them. For more information about e-Plugs, contact Harris Lee at makharr@siue.edu. Photos: Jason Pappas, a sophomore in the College of Arts and Sciences, talks with SIUE Charter High School freshman Jaymz Young. Dawn Huckleberry, SIUE advisor, and CHS sophomore Leslie Brazier exchange information in the “Bingo to Meet You” game.